Capitals General Manager George McPhee (GM GM) has received deserved praise for his signing of all-world goaltender Tomas Vokoun. Vokoun's availability in a competitive, free spending marketplace came as a shock to many, particularly the elite netminder himself. But with the shock came a surprise call from a contender. “For me, as much as it’s been a tough couple of days, I know I’m going to have fun,” Vokoun said. “I’ve been on winning teams before but nothing like Washington… So I’m hoping that it’s something I’m going to enjoy and really take advantage of and play even better than I have in the past. As we mentioned earlier, McPhee and the Caps have received plenty of recognition for the Vokoun deal. It would seem the euphoria created by one great signing has clouded the vision of those looking at the Capitals overall off-season picture. 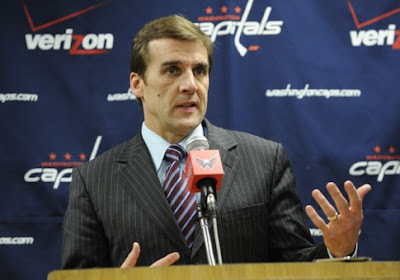 Let me start off by saying that I believe George McPhee to be one of the finest GMs in the game. However, I believe that his off-season thus far, has been equal parts both genius and foolishness. Without question the Vokoun signing, the trade haul (first AND second round picks) for Varlamov, and the bargain acquisition of Jeff Halpern provide ample evidence of McPhee's brilliance. Yet, the Varly coup was somewhat offset by an earlier deal for a 25-year-old restricted free agent forward who largely has been a disappointment in Chicago. Troy Brouwer cost the Capitals their 2011 first round selection. While he does provide Washington some grit, and Cup winning experience, Brouwer has not been the goal scorer that he was expected to be at the NHL level. Nor has he been an effective player in the post season. Particularly last season, when he was completely blanked in the series against Vancouver. Brouwer's production simply has not been consistent with that of a player worthy of a first round selection. So why give one up for him? Compounding the issue is Brouwer's new deal which will come with a two-year cap hit of $2.35 million. Consider also the signing of Roman Hamrlik. On a team rich in blueline puck movers, was the addition of a $3.5 million, lock-down 35+ contract necessary for an aging defender well past his prime? Given you can argue the need for Brouwer and Hamrlik, even at their cost; but what is the rationale for locking up Joel Ward to the tune of $12 million over 4 seasons? Ward had an impressive playoff performance for Nashville last season. Yet was it so impressive that the third, and sometimes fourth line player, became worth the investment of a $3 million cap hit? Like McPhee, I like Joel Ward... at a third of the cost. Certainly, Ward's intangible contributions are the stuff that Washington is desperate to add to their lineup. They just didn't need to appear so desperate to do so. The Caps were one of the NHL's elite again last season. That is to say, regular season elite. After another early post-season flame out, players, coaches, team executives and fans alike, were left scratching their heads, searching for answers. With the moves made by McPhee, are they a better playoff team today? Probably, yes. With RFA Karl Alzner still unsigned, and next seasons' group of impending free agents which includes the likes of Alexander Semin, Mike Knuble, Mike Green, Dennis Wideman and John Carlson, did they need to invest so much into the role players they acquired this season? Probably not. Time will answer both of these questions, and also whether McPhee's summer was, in fact, a Jekyll and Hyde act. For now, like Will Hunting's job interview proxy, I believe McPhee's off-season to be "suspect." Sometimes isn't only the money and bet that they offer a lot of great incentive for him to stay with him. Host PPH community did a speculative list.